This website has picked up an International Business Award in the category of best public information multimedia. Below is a copy of the press release by the University of Nottingham. - Click here for the original press release. The University of Nottingham's innovative 'Test Tube' project - the online showcase for the work of Nottingham Science City filmmaker-in-residence Brady Haran - is to receive an International Business Award 2008. The awards - based in the United States - are the only global, all-encompassing business achievement programme which honour outstanding performance by companies and organisations. 'Test Tube' - which can be seen at www.test-tube.org.uk - is this year's winner in the category 'Best Public Information/Interactive and Multimedia' produced by any business or organisation worldwide. The accolade will be presented at a gala dinner on Monday 8th September. The event, sponsored by Dow Jones, IDA - the Irish Inward Foreign Investment Agency, Weber Shandwick and BT, is to be held at The Shelbourne Hotel in Dublin, Ireland. Last year's awards were presented in Munich, and in 2006 they were staged in New York City, where presenters included BBC Business presenter Tanya Beckett, and Gavin and Stacey (BBC Television) co-writer and star James Corden. 2008 winners in other categories include: South Korea Telecom, Accenture, The Indian Oil Corporation, FedEx, IBM, Samsung, Nationwide Building Society, Research in Motion, Siemens USA and INSEAD, the global graduate business school. Professor Christopher Rudd, Pro-Vice-Chancellor for External Relations and Communications at The University of Nottingham, said: "This recognition is great for the members of our science and engineering community - staff and students - who have allowed Brady's camera to share pretty much every aspect of their work with new audiences on the web. The results have been honest, and the story telling hugely entertaining. The success of the project is shared by all of the participants, but is undoubtedly due to the flair and fascination of Brady Haran, who continues to be a superbly creative filmmaker-in-residence." Haran, who first worked in newspapers in his native Australia, where he wrote about science and technology, is now well established as a news and features video journalist and reporter in the United Kingdom. He was appointed to the part-time role of Filmmaker-in-Residence at The University of Nottingham in Autumn 2007, after spotting a number of advertisements in media industry publications. Jonathan Ray, Director, Communications, at The University of Nottingham said: "We were determined to recruit someone with great editorial judgement and a passion for science, but who also had the technical skills needed to get really close to our scientists, without disrupting normal life in the laboratory or out in the field. "Brady does everything himself - filming, editing and website management - and within just a few weeks he started uploading films to www.test-tube.org.uk. They have really captured the reality of life as a student or research scientist and engineer. This award is thoroughly deserved and we hope that it will encourage even more people to view Test Tube and learn more about life both in and out of the lab." The most watched Test Tube film to date has been the story of biomedical scientist Aziz Aboobaker and his work on 'immortal worms'. Test Tube made the news when one scientist - Dr David Scott of The School of Biosciences - felt no need to tone down his sense of frustration and irritation when funders turned down his application for a grant. Haran's filmmaking has also included a trip to the Swiss Alps, where Nottingham engineer Dr Janet Folkes piloted The University of Nottingham hot air balloon on its maiden flight. Other Test Tube favourites have included startling insights into the world of acclaimed Nottingham research chemist Professor Martyn Poliakoff CBE FRS, and profiles of PhD candidate Prudence Mutowo as she strives to become 'Dr' Mutowo and her colleagues wait to see how she fares in the nerve wracking 'viva' interview. Notes to editors: Following preliminary judging by approved volunteers worldwide, the International Business Award winners are selected by members of a Board of Distinguished Judges and Advisors. This year they included Donald Trump, Chairman, President & CEO, The Trump Organization; Joyce Rogge, Senior VP-Marketing, Southwest Airlines; Dr. Ajit Pathak, National President, Public Relations Society of India; Margery Kraus, President & CEO, APCO Worldwide; and John Lim Kok Min, Chairman, Senoko Power, Singapore. 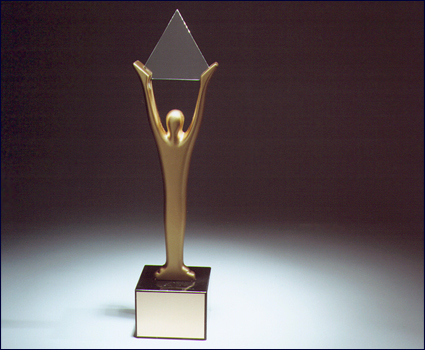 Entries to the International Business Awards grew 65 per cent this year. University of Nottingham is ranked in the UK's Top 10 and the World's Top 70 universities by the Shanghai Jiao Tong (SJTU) and Times Higher (THE) World University Rankings.